The two-day wait for an MRI report was excruciating when Kalyan Sivasailam’s close friend Syed Ahmed, 48, was admitted to hospital with hypertension in 2015. The duo was exploring entrepreneurial opportunities in the health care sector around the same time. 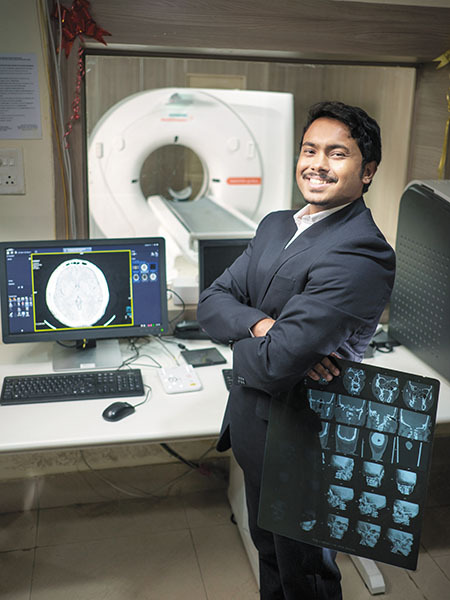 A few months later, in February 2016, they started 5C Network, a cloud-based platform that connects about 200 hospitals and diagnostic centres to 100 specialist radiologists for on-demand diagnosis of X-ray, CT and MRI scans. “There are fewer than 10,000 radiologists in India,” Sivasailam says. “Even then, access to quality radiologists is a concern.” CSI (Church of South India) Hospital in Mysore was the company’s first client in October 2016. Since then, it has been handling over 1,000 scans a day which are uploaded on the 5C Network cloud. Radiologists are notified through an app. The average turnaround of a scan is 42 minutes and they are cross-checked by another radiologist. As tech-enabler, 5C collects a fee from hospitals and radiologists. It earns over ₹3 crore annually and recently raised seed capital from Unitus Ventures, Axilor Ventures, and IIM-Ahmedabad. Sivasailam, meanwhile, has set himself ambitious targets. Over the next year, he wants to increase the number of hospitals and diagnostic centres to 500 and bring 250 radiologists on the platform.